The O. L. Hinds Company was listed as a wholesale dry goods concern located in Highgate, Vermont. 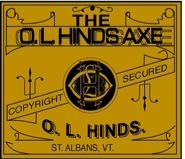 The name O. L. Hinds was registered as a trade name by the Rixford Axe Co. This suggests there was some type of business connection between the two concerns. Various references and advertisements suggest that the use of the name was done in such a way so that it was considered a company rather than a product line. This arrangement may have made it possible for Rixford to sell to competitive hardware retailers that were located close to each other. In many instances company salesmen would make agreements with a dealer that the maker would not sell the same products to any of the dealer's local competitors. In such circumstances some makers would market fundamentally the same goods under a different brand so they could also be sold to competitors. The color of the labels sometimes differed as well as the color or finish of the axe. Those variables along with the use of other company names and sometimes locations made such selling practices possible. The brand O.L. Hinds was registered and owned by the Rixford Mfg. Co. Some labels included St. Albans, VT as the company location primarily because that was where one of the manufacturing facilities were located. Other labels included New York as the company location but that was actually an office address for commercial purposes. Labels bearing the O.L. Hinds name and the location New York, N.Y were used as if they were an individual company. 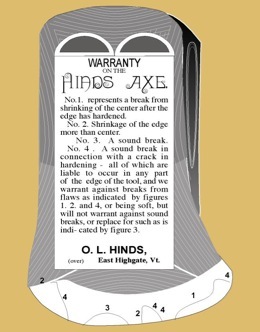 One side of a trade card dated 1891 indicating the degree to which O. H. Hinds axes were warranted. The opposite side indicated the warranty was good for 15 days starting on 1/19/1891, along with the names of the buyer and seller. 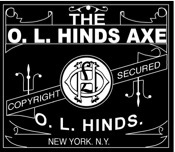 Approximately full size reproduction of a trade card used to advertise O. L. HINDS Axes. Such cards would be handed out with the name of the salesman or seller added to the bottom. The ROUGH & READY brand label was quite similar to that EBONY brand labels used by O. S. Rixford. Cross reference articles published on the YesteryearsTools web site that relate to this article; The Rixford Mfg. Co. and Bedford Mfg. Co. 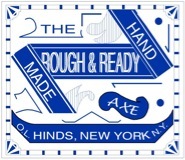 This company will be included in the NEW ENGLAND AXE MAKERS booklet.